Ask anyone over 55 and they’ll recall with crystal clarity the moment Neil Armstrong spoke those eight words into our generation’s identity. We were changed by NASA’s feat in a way I can’t explain to my children. Their reality naturally includes boot marks on the moon. To those of us who remember, though, seeing it happen made us wish we could be astronauts on a mission. Magic of a specific vision: Kennedy set the vision. NASA saw it through. Setting vision is a core skill found in every one of my successful clients. They see the invisible, define it and make it real to everyone in their company. It’s magic. Power of process: You can’t take step two without first taking step one. Getting to the moon meant taking a bazillion steps. Creating a logical sequence for those steps is process. Process makes your steps, and their success, duplicatable. Multiplying force of daily action: The moon wasn’t reached in a day. It was reached in many a day’s daily effort. The investment of what’s done today is compounded by what is then done tomorrow, and so on, day after day. It’s a core success principle: you earn it one day a time. Commitment to the cause: Getting to the moon wasn’t a job. It was a cause; something deeply personal that united us. You might quit a job, but you can’t quit a cause. Successful clients don’t run businesses, they champion causes. 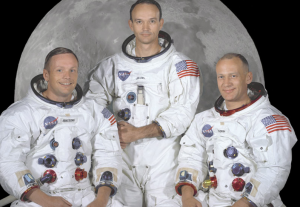 Discipline of purpose: Neil Armstrong didn’t come back from the moon boldly waving the first-man-on-the-moon banner. He came back and returned to work. He had a mission. Mission accomplished. Next, please. Humility is a common trait of the truly successful. That’s a subtle takeaway from Apollo 11 often lost in all the hoopla. Armstrong wasn’t aiming for history, he was aiming at the moon. He wasn’t striving for stardom. He was a pilot with a flight plan. Nicely done. Thank you, Mr. Armstrong, and all of NASA’s quiet heroes, for showing us how it’s done. Now, how about you? Ready for liftoff?